Are you ready for Christmas yet? I just looked at the calender and swear I felt some heart palpitations... Eeeeek! So much I still want to do and hopefully enough time to get it all done!!! 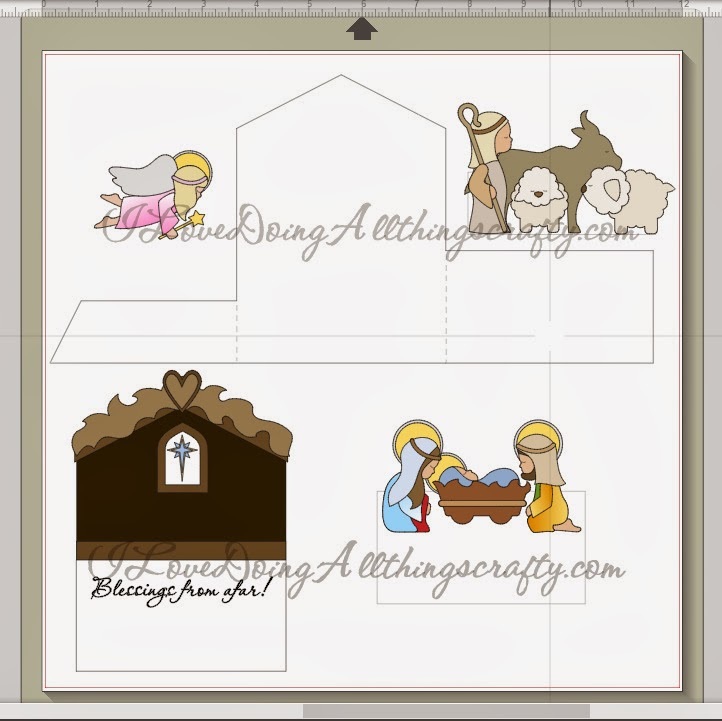 Today I want to share a Nativity Scene Card I made using only the Print and Cut feature on the Silhouette Cameo. When you are making more than one card, Print and Cut can save you many hours of piecing all the cut outs together! Well what you think of my super cute Nativity tri-fold Card? Sweet and simple, just how I like it! Reminds me of the cards my parents would receive when I was a little girl, except those where pop up cards... I did love those! I'll stick to tri-fold for now... pop up cards are way over my head! Here is a screenshot of my images before I printed. To make my images more visible, I chose to line each piece with black outline. Also, below you see the base of the card I created... pretty simple! I made this card to fit in a standard 5 X 7 envelope. The inside opens to reveal your message! Plus there is enough space to hand write a personal note. That's beautiful! What a clever idea to make a tri-fold card with it! I love how this came out, (I just got this file, so you have inspired me) and I know I am going to see you doing pop up cards real soon!! These are so adorable! I used this kit for a class project a few years ago and I'm very aware of the time it takes to piece these all together! I have an Eclips, but I'm going to give this a try! Wish me luck! That's a really lovely card. Wow, this is a truely gorgeous card, and love that you show how you created it!! Thanks for linking up at Craftin Desert Divas! !